Also see 'Sports & Activities' for ideas from swimming to new things in Try Your Hand. Entries by distance from Olney (nearest first). 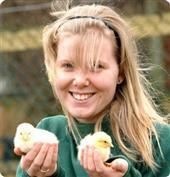 At Thrift Farm there is much for you to do and see: a 52 acre working farm, with Farm Park, café, garden centre and shop. Lavendon Narrow Guage Railway raises money for charity with its Santa Special Train Rides. Once called the Eco Park, Gulliver's Dinosaur & Farm Park aims to teach childen about the world in which dinosaurs roamed – and also how farms provide our food and veg. Theme Park catering for 2-13 year olds which has rides, attractions and shows. Adventure play and imaginative play areas at what was once 'Gambardos', complete with carousel. One of the largest Bird of Prey centres in the UK, there are bird displays and chances to get up close to the birds. A fun and educational trip to the farm, with the chance to see many animals. Animals, tractor rides, sandpit and playareas! Known locally as Activityland this children's play area has a 25 foot climbing wall, giant slides and outdoor 'driving', plus panning for gold and more adventure equipment. A chance to go 'on safari': experience lions, tigers, monkeys and bears close-up from your car in drive-through animal enclosures. And on foot you can get up close to wallabies, squirrel monkeys and exotic birds in this interactive park. Travel into another age! With its sharp curves, its steep gradients, level crossings and unique roadside running, the Leighton Buzzard Railway takes you back to the time of steam. From a huge indoor activity centre to rabbit cuddling, this offers children a varied day out. Set in 600 acres of rolling Chiltern Hills, the zoo is a place to observe animals in what it hopes is as close to the natural habitats as possible. ZSL carries out much conservation work for endangered species. Animal Farm & & Leisure Park with an old fashioned fun-fair. A whole range of animals with indoor and outdoor play areas. The world's oldest model village! This is a 1930s timewarp...six little villages in a 1.5 acre miniature landscape. Has to be seen to be believed.